Navarro Vineyards came highly recommended when I planned our trip to Anderson Valley in northern California. But, when we first arrived at the tasting room – on a pretty crowded Saturday in October – and the menu offered 18 wines to choose from, I wasn't sure this was the place for us. On the rest of our trip, we had learned that more varietals often meant less attention paid to each bottling. We escaped with a bottle of Gewurztraminer. When we opened the bottle, back in Massachusetts, it turned out I couldn't have been more mistaken about Navarro. The winery is known for their whites, and with good reason – I fell in love with the Gewurztraminer (and summarily dismissed all my pre-conceived notions about Alsatian-style wines...namely that they are cloyingly sweet). 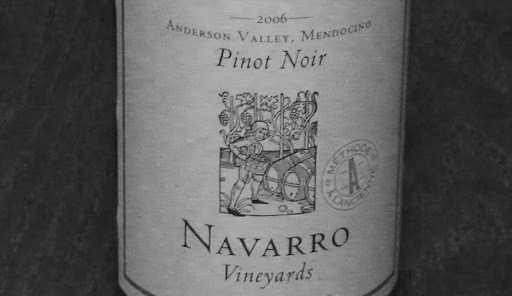 Later, when we decided a wine shipment was an essential way to get a piece of Anderson Valley at home,* the box that arrived on our doorstep included a bottle of Navarro's pinot noir. We recently opened the 2006 Pinot Noir, on a night when the first chill of fall was in the air. It felt right to open a red (we haven't been drinking much red in the crazy heat of this Jersey summer). A late summer dish of eggplant parmesan and homemade breadsticks seemed like the right partner. As I chopped cherry tomatoes and breaded eggplant, Doug opened the wine. We let it breathe for about ten minutes and had our first sip. This wine is spicy, with hints of the red fruit you expect of a California pinot. As it opened, the tannins began to melt away, but the bold spice and cherry flavors remained. Let me emphasize, this tasted like one spicy pinot noir. Doug tasted clove. My observations are never this specific; I felt like I could sense some slight acidity behind the vivid flavors. (Acidity is one of those things that people always talk about with wine, and I remember vividly the first time I actually figured out I was tasting acidity. It causes this tingling on my tongue, and I swear, it is the only characteristic I can reliably identify.) This is no shrinking-violet pinot noir, but a surprisingly forward, medium-bodied wine. It almost spills over with the taste of the earth. We both agreed the wine was a good match for the eggplant – it cut through the cheese and stood up to the tomatoes. I am a Navarro Vineyards convert. (Read: slightly obsessed fan. Doug might block me if he gets another email about the special they are running on any particular wine shipment. Wait, did I mention they ship delicious wine for very reasonable prices?). Don't be surprised if their wines show up regularly on these pages. 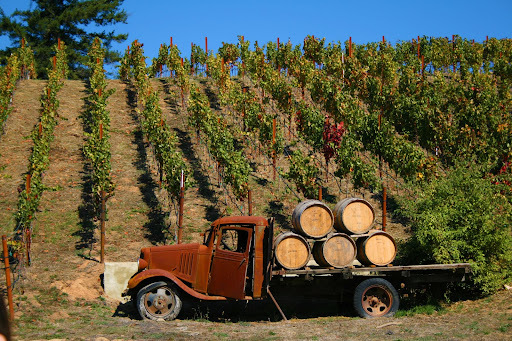 *Anderson Valley is a sleepier, more rustic version of Napa, about an hour north. If you live on the East Coast, their wines might be hard to find in stores or you'll discover that state laws can make it exceptionally difficult to get wine delivered to your door. Have any friends or family in states with more relaxed liquor laws? Consider seeing if they wouldn't mind buying you wine for your next birthday.